Movement helps us to connect to the world around and within us. Dance creates movements that connect to our creative self, liberating us to express "the hidden language of the soul of the body" (Martha Graham). 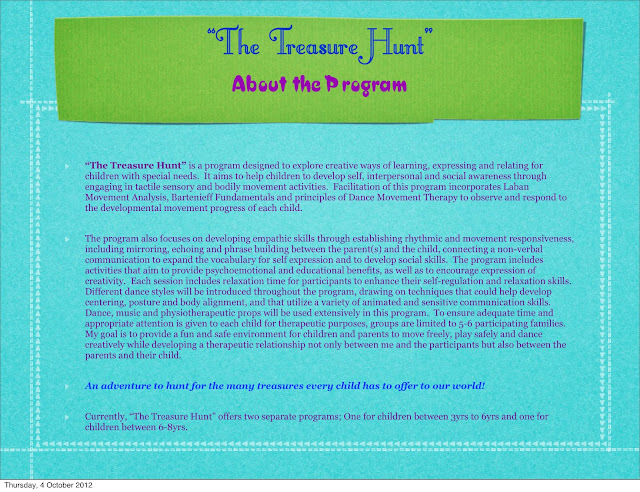 Dance Movement Therapy (DMT) offers an evidenced based, friendly, creative and positive environment in which people with autism, down syndrome, learning disabilities, physical/intellectual disabilities, dementia, mental illnesses, traumatic experiences, mood disorders, stress & anxiety issues, etc and their support peers engage in a fun, gentle exercise and creative movement activities to enhance well-being and to bring about therapeutic change. DMT individual and group session could be offered as a psychotherapeutic process that aims to help individuals in attaining skills to regulate impulsive behaviors, develop empathic skills, transform emotions for self-development, release stress & anxiety, manage burnt outs, process grief & trauma and provide a creative externalizing perspective on issues the client wish to explore. The Treasure Hunt (Longueville) Term 4 starts on 13th October!!! During my interactions with people with autism, I find it extremely difficult to help others to understand there are reasons behind all of our actions (behaviors). These reasons might be counsciously, subconsciously or unconsciously intentional or unintentional, but they remain as the reason for our actions. Naturally we try to read these actions as appropriate or inappropriate, but does the sense of appropriateness comes from our emotional availability to respond to the other? Or does it come from how we are educated by the society or the system we are under without us questioning it? Or is it genuinely a result of mindful logical reasoning? I have observed that often medical professionals, some therapists, carers and parents would easily neglect the need of a person once they have been diagnosed with a label, rather than truly identifying the nature of their symptoms, often it is conveniently generalized in a term that doesn't mean much, other than imposing shame, discrimination and dis-functioning of a person. A "person" with a diagnosis who senses, feels pain, shares feelings and thoughts like everyone else would. The way how people with autism internalize these information and bring it to expression might be different from the norm, but that doesn't mean they do not have access to their inner world or lack the ability to develop relational skills. They respond to their environment just like anyone else would, but in addition with the challenges of a different neurological order. They are still people who go through the attachment stage, emotion & impulse regulation needs, eager for new information & experience, they still go through physical, sensory & intellectual development like others would. Possibly at different levels at a different pace which may require both inner and outer resources to help them adapt to a developmental rhythm that might be different from the majority. But at the end of the day, don't we all look at life with the unique lens of our lives? I think the use of giving a condition with a diagnosis is only good up to the point where it provides a guideline for therapies or treatments. But somehow it is becoming so widely used as a convenience to define a person, where it could even hinder how efficient therapies are interpreted, how relevant or irrelevant a person's emotions, responses, reactions and behaviors are considered or not considered. I am not advocating for autism rights here, but I am advocating the respect for human dignity within how diagnosis of any kind is translated and interpreted by the professionals to the society. Diagnosis can create help, but it can also create hell. Here's a reading I find illustrates some of the misunderstandings of the diagnosis of Autism. "The Treasure Hunt" is coming to Longueville!!! Special kids have special ways of connecting and expressing, often VERY CREATIVE !!! I believe we all have special ways in how we relate to our "self", to others and to our surroundings. It is important that children be encouraged to explore their unique expression and for parents to identify them in order to create an empathic relationship. In understanding children's unique expression helps us respond to their needs and assist them to reach to their full potentials. 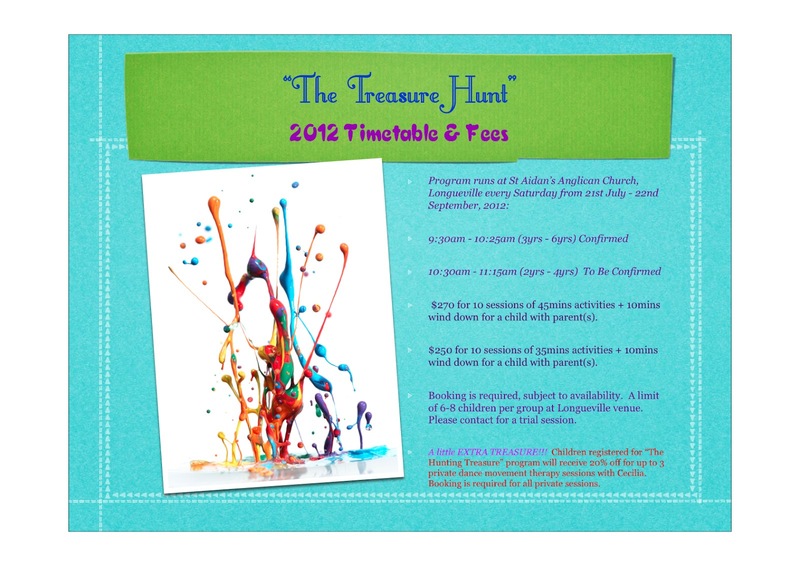 All children are gifted, we just need to go with them for this treasure hunt. In the coming up program, I'm inviting parents to "GO WITH" the children into their creative world through dance, music and movement to discover the treasures of "AWARENESS", "COMMUNICATIONS", "EMOTIONS" & "CREATIVITY". Children primarily need their parents to be their audience and their mirror to reveal these treasures to them. As well as to guide them in knowing how to handle these treasures. Let us go into this exciting adventure together and discover the "KEY" that leads us towards a life of abundance for all of us~! Having worked with people living with Autism in the past years, it has occurred to me that it is important not only to help my clients to develop body & self-awareness but also those who are around them, the parents and carers. Most people are often unaware of the non-verbal language that they carry with them. While verbal language constitutes approximately 10% of human communication, we actually rely on non-verbal communication a lot more than we assume. People living with Autism however are often more sensitive and receptive to this non-verbal language. Through "mirroring" that is to reflect movements, we could help develop empathic communication with one another. 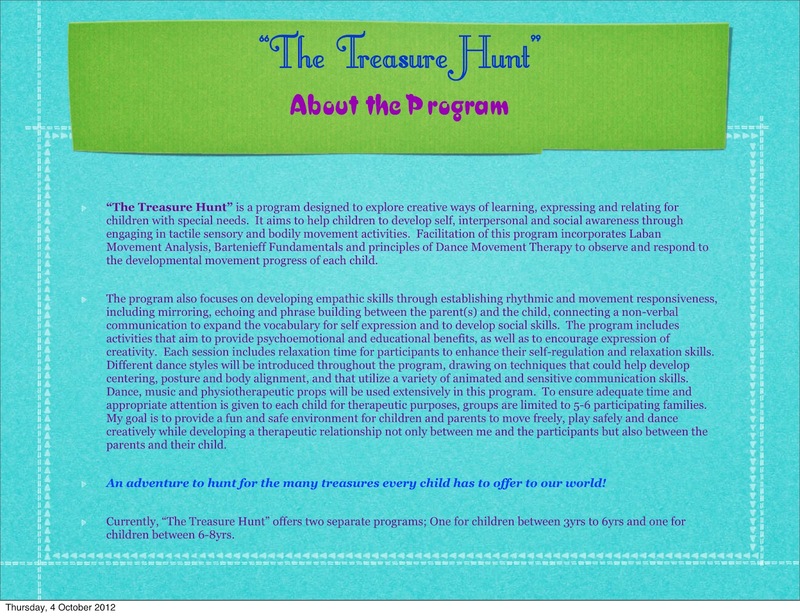 I shall be looking into developing a program that could help address the issue on body movement reflection to help children to build movement rapport and empathy with their parents. This approach has already been integrated in my practice with adults living with various forms of disabilities and their carers. Through this program I hope to help equip these children with more tools to help better express and communicate themselves, as well as to develop better understand of the world around them. 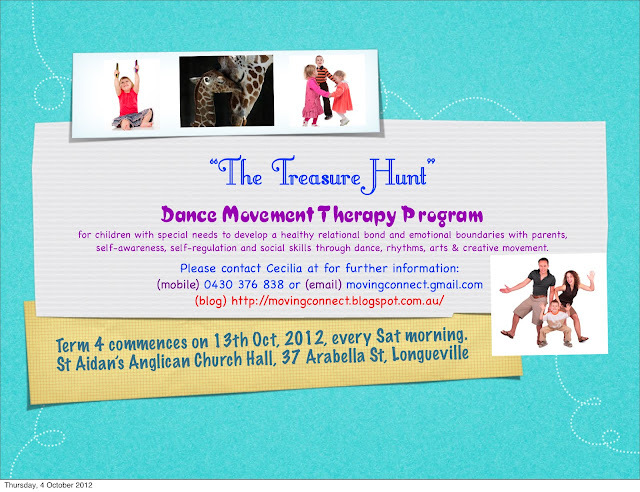 Don't be scared by the word "therapy", "dance movement" gives it all the fun~! 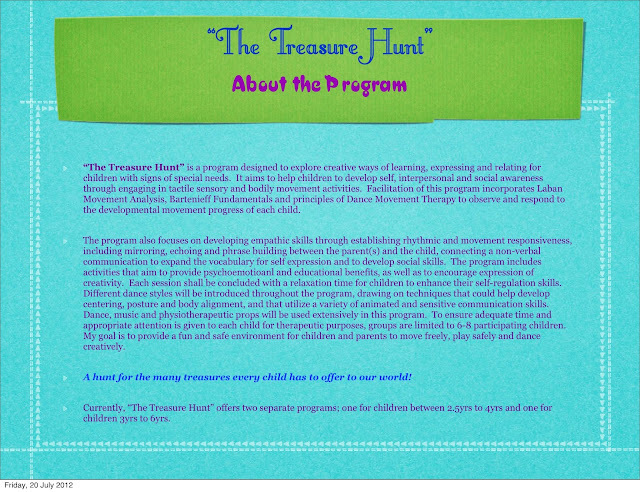 Here is a link to which a dance movement therapy session took place with a boy with autism, it shows how this dance movement therapist engaged the little boy in one of DMT creative process in mirroring.